In order to show that your VoIP service is compatible with the Ozeki Phone System XE IP PBX, you need to place the following logo on your webpage. For this, you need the Ozeki VoIP Service Compatibility logo image (available in different sizes to fit your website's layout). 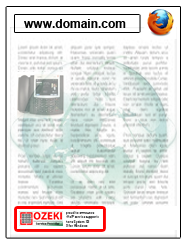 Next to the logo you need to place a text that clearly states that your VoIP service supports Ozeki Phone System XE. 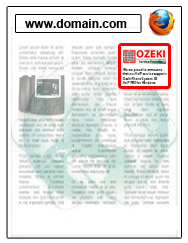 Download the Ozeki VoIP service compatibility logo by clicking on the link and save it into the www root folder on your webserver. Copy and paste the following HTML code to the source code of your webpage. After these steps, check your website to make sure the Ozeki Phone System XE compatible VoIP service satement is shown correctly. There are different ways of to place the statement on your website: horizontal (picture on the left) and vertical (picture on the right). If you take a look at the pictures below, you can see where and how it can be placed on a webpage.